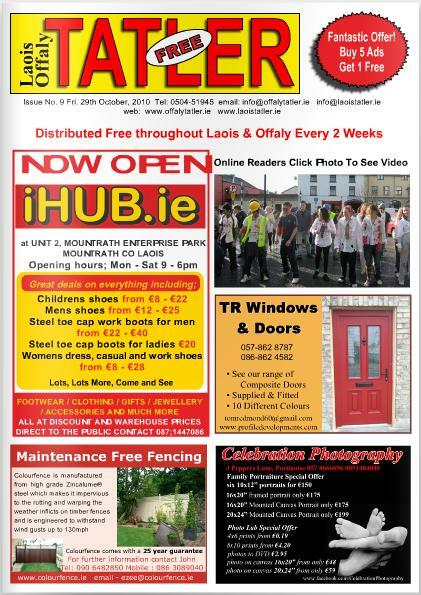 The Laois Offaly Tatler has become the first regional publication in those counties to offer people a free interactive online experience while reading the magazine. In the latest issue, people reading online can click on a photo on the front cover which takes them to a video related to the image. The video is of the “Thrill The World” World Record attempt held in Tullamore, Co Offaly on Saturday October 23rd. 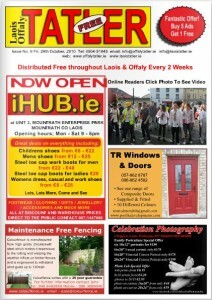 The Laois Offaly Tatler is a free fortnightly magazine distributed throughout both counties and contains local news and business advertising for the people who live there. It is a sister publication of the Tipp Tatler, which has been published in Co. Tipperary for over eight years. Thrill the World was a worldwide record attempt for the Largest Simultaneous Dance to Michael Jackson’s “Thriller.” Thousands of people in cities around the world learned the Thriller dance and performed it precisely at the same time. Thrill The World Offaly was in aid of The Carers Association, a national voluntary body headquartered in Tullamore that helps people who care at home for loved ones who are elderly and frail, seriously ill, people with disabilities and children with special needs. Over 160,000 people in Ireland give care at home every day to somebody who needs their help.